Inner Space Center to broadcast ENDEAVOR LIVE! 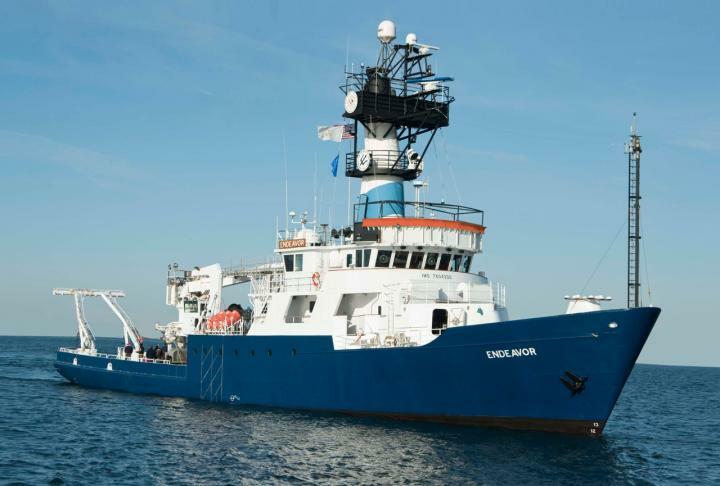 KINGSTON, R.I., April 3, 2019 — Students from the University of Rhode Island Honors Program will embark on a six-day expedition aboard the URI Graduate School of Oceanography (GSO) Research Vessel (R/V) Endeavor to conduct ocean research – and on Earth Day, April 22, you can join them! Supported by the Inner Space Center (ISC) and led by Melissa Omand, assistant professor of oceanography, and Christopher Orphanides, chief scientist and GSO graduate student, students will focus on whale, zooplankton and environmental interactions that occur in the coastal and offshore waters of Southern New England. Learning more about these interactions is essential to management and conservation decisions for marine species, such as the critically endangered North Atlantic right whale. The students, from various academic backgrounds, will board the R/V Endeavor at URI’s Graduate School of Oceanography on April 18 and over the course of the voyage will conduct marine mammal surveys and use a variety of tools to collect samples and data to study biodiversity, water properties and other aspects of underwater life to better understand the marine environment, under the supervision of GSO and National Oceanic and Atmospheric Administration (NOAA) scientists. Classrooms around the country can join them via four, 25-minute Endeavor Live! broadcasts as Holly Morin, a marine biologist at the ISC, introduces viewers to the scientists and students onboard. Classes will have the chance to interact and ask students questions about their experience on the ship, the research conducted and data collected, what animals have been spotted on the journey and what they’ve learned. Registration is required to take part in these live interactions. Use this link to register. Members of the general public may also follow along and ask questions via Facebook Live. Be sure to “like” the Inner Space Center Facebook page to follow this expedition and others. Registration is required to take part. Use this link to register. Be sure to “like” the Inner Space Center Facebook page to follow this expedition and others. Located at the University of Rhode Island Graduate School of Oceanography, the Inner Space Center is a one-of-a-kind national facility that supports live ocean exploration using telepresence technology.